It was Halloween day 2014, a Halloween day that went on to become potentially one of the most important days in the resurgence of Michigan football. I remember this day well, I was in Dearborn early in the morning finishing up the last of my required volunteer hours with a campaign for my political science class. In the campaign office, sports talk radio was playing in the background, I heard the update that stated Michigan president had scheduled a press conference for that afternoon. In the midst of the Shane Morris incident, and the buy two Coke’s for tickets travesty, all assumed the firing of then Athletic Director Dave Brandon was coming. But nobody knew who would take over for Brandon. Michigan president Mark Schlissel had announced that former Steelcase CEO Jim Hackett would take over as Athletic Director on an interim basis, a tag that still holds true today, for now. What Hackett would do once he took over, nobody saw coming. 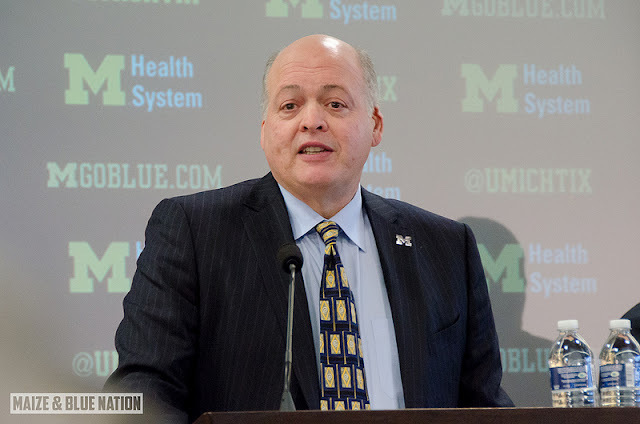 “Interim” AD Jim Hackett fired Michigan’s coach at the end of an extremely disappointing season, I don’t think I need to mention the name of coach, but it rhymes with Katie Broke…. Next, Hackett did the impossible, he did what every “expert” said was NOT going to happen, and took the risk of putting the program even further behind if he swung and missed, but he had confidence. On December 30th, I sat in Jung Hall and Hackett presented a crowd of media, alumni, and players that he landed “Our guy.” He did it, he brought in Jim Harbaugh, and Michigan football was back on track for greatness. Hackett didn’t stop with Harbaugh. It’s safe to say that nobody has been overly pleased with Adidas. Hackett knew this, and so he managed to ink Michigan a new and HUGE deal with Nike, yet another win for the University of Michigan Athletics Department. Hackett has been tremendous in his short time as interim AD. Without a doubt, that interim tag needs to be lifted, and it will be lifted eventually. Hackett had a vision for Michigan football, and he is not done doing what he can to get Michigan to the level he wants it at. I think I speak for every Michigan Athletics supporter when I say this: Lift that interim tag, and let Jim Hackett run loose.